Before the Christmas break, we invite you to discover the new project by drummer Ahmad Compaoré, who has chosen to reunite both guitarist Kelyn Crapp and trumpet player Nicolas Folmer - his sidekicks from the Lucky Peterson's 4tet, nothing short of mind-blowing! - with bassist Chyco Siméon as special guest. Anyway, a smart set for these concerts not to be missed, that will make you travel between three continents at the crossroads of jazz, funk, soul and world music. Hoping to see you again in 2019, we wish you Happy Holidays and Season's Greetings. Keep your spirit sharp, your eyes peeled... and be all ears! Concert-creation proposed by the World Music Centre. 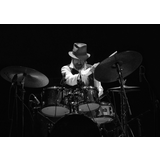 Having shared the stage with Fred Frith, Barre Phillips or Marc Ribot, the insatiable drummer draws his inspiration in the influences instilled in various singular projects around jazz, blues, improvisation, experimental rock and fusion. But mostly at the root of his Egyptian and Burkinabé origins. Here, Africa outshines even more: from faraway tribal rhythms to the brass band parades of his childhood, the creative euphoria is a call of reality through the dream, in a very organic depth. 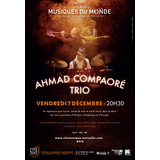 Tonight, Ahmad Compaoré performs alongside the prodigy guitarist Kelyn Crapp from California and Nicolas Folmer, one of the most talented French trumpet players of his generation. Gathered by the American bluesman Lucky Peterson to participate in his latest tour, the three musicians have travelled together around France during one year. In the course of their concerts, they have developed a great bond, as much human as artistic. Following a residency at the Cité de la Musique, they set the scene on three continents - Africa, America and Europe - with a jazz fusion repertoire, tinged with soul and world music. Cité de la Musique, Auditorium, 4 rue Bernard du Bois, 13001 Marseilles. 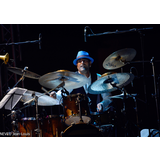 Having shared the stage with Fred Frith, Barre Phillips or Marc Ribot, the insatiable drummer draws his inspiration in the influences instilled in various singular projects around jazz, blues, fusion and improvise music. But mostly at the root of his Egyptian and Burkinabé origins. Here, Africa outshines even more: from faraway tribal rhythms to the brass band parades of his childhood, the creative euphoria is a call of reality through the dream, in a very organic depth. This new project on the initiative of Ahmad Compaoré gathers the prodigy guitarist Kelyn Crapp from California. Gathered by the American bluesman Lucky Peterson to participate in his latest tour, the two musicians have travelled together around Europe in 2017 and 2018. In the course of their concerts, they have developed a great bond, as much human as artistic. Tonight - with the support of a bassist with an awesome slap - they set the scene on three continents (Africa, America and Europe) proposing a jazz fusion repertoire, tinged with funk and world music. Doors open at 19:30 / Concert at 21:00. Catering on the premises. Jazz Fola, 2422 avenue Fortuné Ferrini, 13080 Luynes. La Caravelle, 34 quai du Port, 13002 Marseilles. You're receiving this email because you're subscribed to the newsletter. To ensure that you continue to receive emails from us, add to your address book today. This is not a spam - to unsubscribe please send this message back with the mention "unsubscribe".